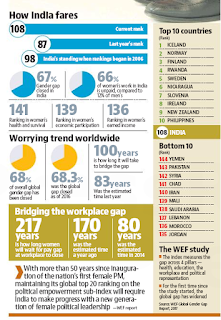 India has slipped 21 places on the World Economic Forum's Global Gender Gap Index to a lowly 108 this year, behind neighbours China and Bangladesh, primarily due to poor participation of women in the economy and on account of low wages. 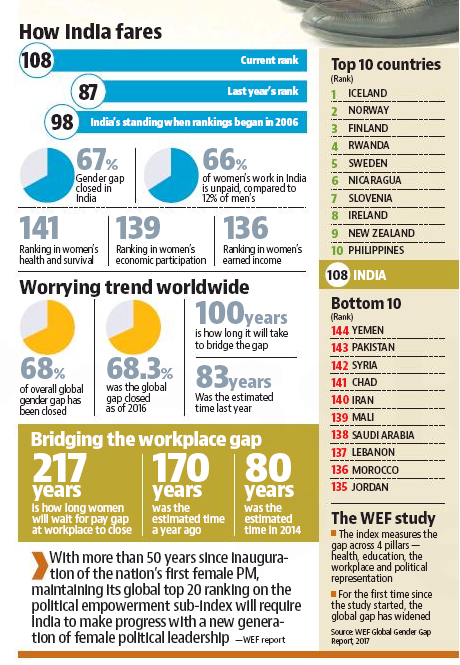 India closed 67% of its gender gap, which was less than what many of its international peers achieved. Globally too the scenario isn't encouraging. For the first time since the index launch in 2006, the global gap has actually widened. At the current rate of progress, the global gender gap will take 100 years to bridge, compared to 83 last year. The case is worse in terms of workplace gender divide, which the report estimates will take 217 years to close.